It began as long ago as 1923, it seems. Backtalk from deer. First with Bambi’s incessant questioning of his mother, and then on to 1938, when Flag (aka, “The Yearling”) ate Jody’s mother’s vegetable garden. 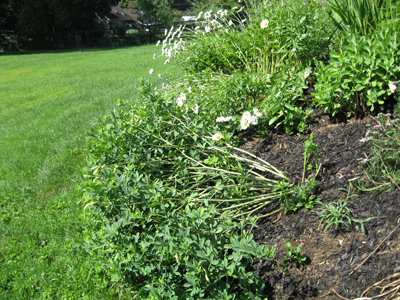 And now it is 2011, and while my vegetable garden is adequately protected from white-tailed deer, my flower beds have suffered. Not content to eat my flower buds and leaves, they also (oh, the indignity!) use my plants as MATTRESSES, bedding down for the night. 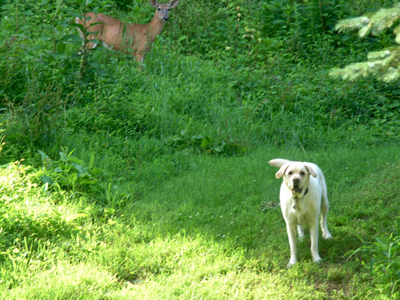 Brazen deer, hysterically ineffective dog. And even though she failed, we praised her effort, and she grinned with pride. Good dog! The deer used to consider my yard their equivalent of I-95. I cleaned up after the deer more than the dogs. They strolled down the hill behind our house under cover of darkness, snacked on my rudbeckia buds, “Autumn Joy” sedums, and my ill-advised hostas, and continued on to the reservoir woods across the street. Then Husband built my beautiful garden, and erected a 7′ high fence of deer netting. Not only were the deer denied access to my vegetables, flowers, and herbs, the fence disrupted their ravage-route, and there was no more evidence of deer for two years in our yard. I was happy. I started to research, acquiring knowledge to combat the scourge. Know thine enemy. That gave me pause….Do I stand a chance? 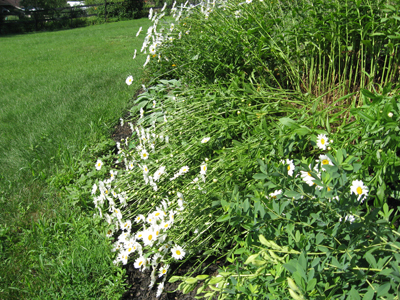 My beautiful stand of shasta daisies, brought down by some of those 15 million herbivores. — High populations of deer may result in numerous deer-vehicle collisions and pose a serious threat to motorists. It is estimated that each year in the United States 29,000 people are injured and more than 200 lose their lives in deer-vehicle collisions. More than 50,000 deer-vehicle collisions are estimated to occur in New York each year. — Deer are very adaptable, however, and greater numbers are living in suburban neighborhoods, which have a combination of open lawn, succulent summer gardens, plentiful ornamental shrubs…. — In their first pregnancy, does usually give birth to a single fawn, though twins are common in later years if food is abundant. Older doe + abundant food = twins. She looked a lot bigger, all of a sudden. — Annual estimates of deer damage are reported to exceed $2 billion nationwide, including $1 billion in car damages, more than $100 million in agricultural crop damage, $750 million in damage to the timber industry, and more than $250 million in damage to metropolitan households (e.g., landscape plantings). These estimates are conservative…. Invite a hunter to sit in your yard all night with a loaded gun? 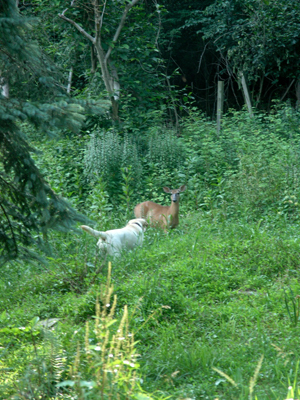 — …buck-only harvests cannot reduce or stabilize deer numbers. Harvesting female deer is essential to reducing deer numbers and deer damage. The obvious flaw in that is that hunters prefer antlers (bucks), to does. Plant the deer equivalent of brussel sprouts? 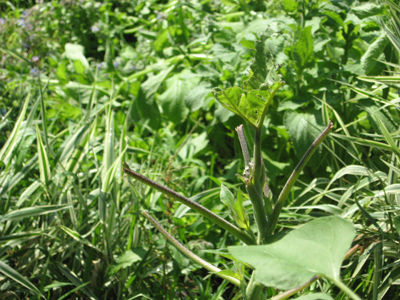 — No plants are completely deer-proof, and hungry deer will consume plants that have little nutritional value. 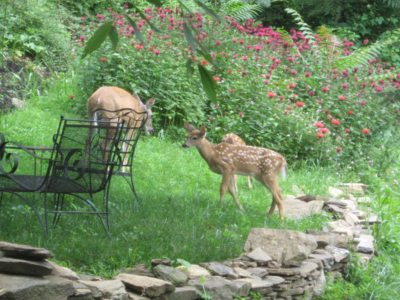 Spray some foul-smelling liquid over your plants (eliminating both human AND deer enjoyment of the garden)? — If deer are very hungry and other food supplies are limited, repellents may not work. Annoy your neighbors by annoying the deer with lights, water sprays, or sound? — A variety of frightening devices, including lights, whistles, loud noises, and scarecrows, have been used to prevent deer damage. Audio and visual scare devices are not recommended around the home or near urban or suburban areas, however, because of disturbance to neighbors, possible violation of noise ordinances, and lack of effectiveness. Deer habituate to scare devices after a few days of exposure. That last sentence was very depressing. OK, the most obvious for last: fencing. — Rope: A cotton rope fence used with a repellent is particularly useful for preventing deer browsing in flower beds or small vegetable gardens…. — Wooden snow fence: Although not an absolute barrier, a snow fence may effectively deter deer from entering small areas…. — Plastic netting and wire cages: can be used to prevent deer browsing of individual plants or small plantings. — Electricity: an invisible fence design that combines wire, a power unit, and receiver collars with highly active, properly trained dogs that are able to withstand harsh winter conditions. The system is not a complete barrier, so some level of browsing must be tolerated. 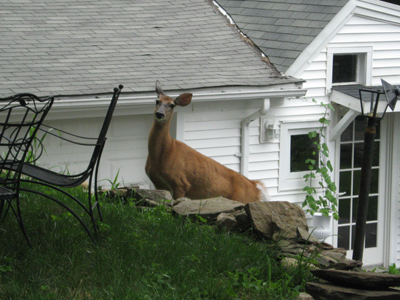 — Permanent woven-wire fences are the best deer barrier. They are used for year-round protection of high-value crops subject to intense deer feeding pressure. These fences are expensive, difficult to construct, but easy to maintain. Oh, thank goodness for that last clause. For a moment there, I thought all was lost. So if I survive the installation of the woven-wire fence, I won’t have to work hard to maintain it? Small mercies…. Okay. I will write about my morning glories instead. 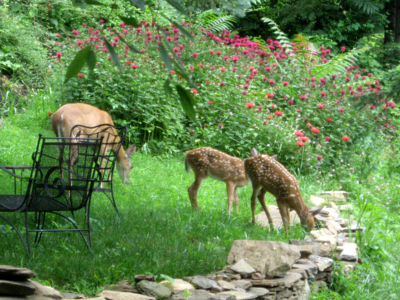 Bambi, Flag, and Resident Doe + twins: Peace. The deer are crazy around here too. I get so mad when I come out and see things chopped down to nothing. Last victim was my daisies-which HAD been loaded with buds just ready to open. I’ve tried everything , but no luck. I’m getting to the point-fencing the WHOLE yard would break us, but sure would be wonderful! Apparently the buds are all protein. It’s so frustrating when you’re anticipating imminent bloom and then the deer get there first!! I sprayed my hostas effectively for weeks, forgot one week, and now I have ornamental stalks lining my sidewalk. Lovely. We’re talking full-yard fencing, too, because Husband wants apple trees and blueberries. $$$$….